My present version of the Delaware & Hudson Railroad is my tenth layout built in HO. 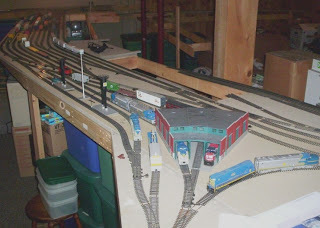 There are some parts that have been in up to four or five different layouts. I have always followed the 'close enough' modeling theory with a freelanced prototype flair which I call "D&Hesque" so the scenes and locations are familiar but also fit my operating needs. 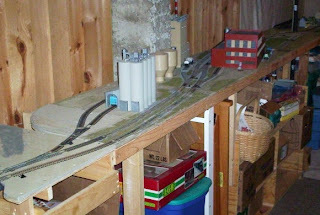 The hub of my layout is Mechanicville based in the late 1970's with XO tower at the south end connecting to a 5 track B&M yard and 10 tracks on the D&H side. WY Cabin toward the north end of the D&H yard connects the north ends of both yards via a crossover between the two D&H mains and the D&H engine terminal is nearby. Going south on the D&H from XO is my condensed version of the Colonie Main which will have some industry including Mohawk Paper, Colonie shops and Albany staging. Colonie will have a small freight yard, passenger coach yard and the north end of Building 1. The industries (other than Mohawk Paper) will be whatever I have on hand from previous layouts where they will fit the best. Headed East from XO on the B&M is the connection to the Southern Adirondack Railroad (freelanced shortline derived from the former Saratoga & Schylerville RR) at LM Cabin then the double track main ducks under the layout into staging. There will be 4 Cabins throughout the layout that are not found in any D&H timetable...ME, CA, LM, and DB. They come from the initials of my four kids so don't bother trying to look them up since if there is any resemblance to reality it is purely coincidental. Following the D&H/B&M joint trackage from WY Cabin, the railroad will continue double track almost directly into a 2 1/2 turn helix to gain some altitude for a duck-under and for the Round Lake branch to be built below. The Round Lake branch was a major part of my last layout so I found (I hope) a neat way to add a small paper mill on the branch. After the helix the double track will come out to CA Cabin (a single powered crossover) then continue west/south to QS Cabin. Like XO, QS will be "D&Hesque" where I will try to get the track as close to prototypical as possible in the space I have. QG, GV and BW will follow that practice. With that said, the B&M will leave QS as the double track it was and climb to an upper level staging while the D&H will go to single track and QG. The Canadian Connector will come off at QG while the main will continue down to GV then into lower staging. I will include the Canadian Main from GV north to BW connecting the Million Dollar wye if space permits. 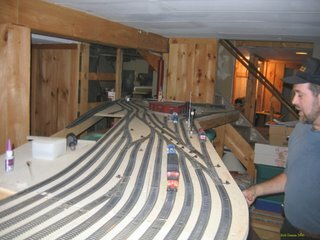 Since my operating plan doesn't include any trains running on this section of track, I may just make it look like its there. The Canadian main will go north but not very far. 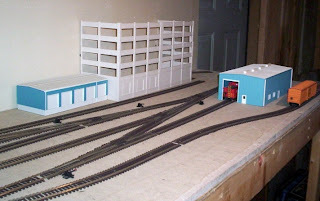 The main will break through the wall to the garage to have a small (3 track or so) staging yard and a connecting track to the Southern Adirondack Railroad for a continuous running option. The Southern Adirondack Railroad is a fictitious railroad that Steve Lamora introduced me to a few years ago. He was modeling the northern half from Ballston Spa to (I believe) Paseico Lake and I needed something to complete a section of my last layout. I chose the old Saratoga & Schylerville Railroad right of way as a starting point. This was an easy choice since I already had Mechanicville as the main yard and the S&S connected to the Boston & Maine Railroad in Mechanicville. The story goes back into the 1950's when the S&S was to have abandoned the railroad, however in my world, another short-line was created and they plugged away for a few years on their own. At some point (pick a date any date) the D&H was approached for some much needed help and the railroad was subsequently upgraded and a new cabin was installed (LM) just east of XO for a better and direct connection to the D&H yards. After the much needed financial help from the D&H, the SAR has prospered and has very close ties to D&H operations. Passenger service continues into the 70's with a former B&M RDC-3 repainted into SAR green with yellow stripes. At Saratoga and Mechanicville the D&H and SAR provide bus service between their respective stations since there are a few miles separating them. Leaving Mechanicville headed north you first come to the SAR freight/passenger station. Just north of the station is the Round Lake Paper Company Mill 3. I haven't figured out where Mill 2 is but Mill 1 will be the one mentioned earlier on the Round Lake branch. The mainline goes through the heart of the mill with an east siding on the south end and a west siding to the north. Just to the north of the mill is Lamora cement and just over a double track thru truss bridge is an as yet unnamed lumber yard. Here the west siding end sand the main is to continue north with at least 1 more industry before the (short) trestle over the north end of Saratoga Lake and the connection to Schylerville. After crossing a lift out section in front of the door to the garage, the SAR terminates in its own Saratoga yard. This Saratoga consists of an engine shop, materials unloading dock, a large warehouse, a coal dealer, a small lumber yard and a 4 track yard which includes a runaround. A friend of ours passed away this past week. 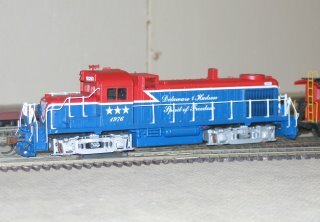 He loved modeling and loved JP's train shop and helped to make it even more successful. He will be missed! Kolothros, Alexander J. COHOES Alexander John Kolothros, 56, died suddenly Friday, December 8, 2006 at his home. Born in Albany, he was the son of the late Leo and Joan Isles Kolothros. He was a 1969 graduate of Albany High School. Alex had been active in scouting and was a former member of the boys choir at St. Peter's Episcopal Church. 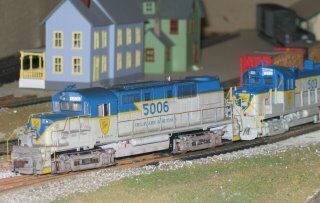 He gained a love of HO Trains, a passion he shared with his father. 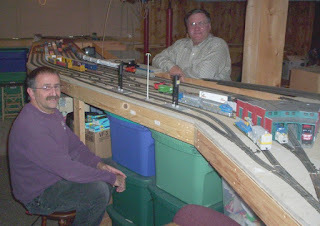 This love of trains continued, and was shared with his good friend Paul Werschler (JP's Trains & Hobbies) and other members of the Click-Clack Club. He worked as a field engineer for guidance and control systems with Litton Industries in Calif. and was a driver for Penske Truck Rental. He served in the Air Force and then the Navy aboard the USS John F. Kennedy. He was brother of Doreen Hughes (Richard) and Mary Berger; uncle of Christine "Goofy Grape" Rodriguez (Benny), Sondra Berger, Deirdre Berger; nephew of Margie Kolothros (late Harry), all of Albany, Terrence Isles (Flora) of Scotland, Dennis Isles of England and the late Kenneth Isles of Scotland; cousin of Eileen Meyers and many other cousins in the British Isles. His cat Squeeky will miss him. Funeral services Monday at 1:00 p.m. in the McVeigh Funeral Home, 208 North Allen Street, Albany. Relatives and friends are invited and may call Monday after 11:00 a.m. in the funeral home. Interment, Albany Rural Cemetery. Contributions can be made to the Mohawk-Hudson Humane Society or the American Heart Association. Unit number 1976, RS3m was painted into a Red, White and Blue scheme to commemorate the Bicentennial in 1976. The loco was renumbered 1976, and returned to its original number 506. This Started as an Atlas RS-3 and was heavily modified.